2009 is the bicentenary of the death of Joseph Haydn, and to commemorate this anniversary Tall Poppies and Geoffrey Lancaster have embarked upon the complete keyboard sonatas. Lancaster has performed the complete sonatas in concert series in Melbourne and Canberra this year, and has been recording the works in Canberra using instruments from the collection of historic keyboard instruments housed in the Canberra School of Music. If you thought Haydn was a dull and predictable composer, this CD will change your mind most thoroughly. Lancaster plays with amiable virtuosity, embellishing as he goes, and finding all the latent humour and passion in these magnificent sonatas. His performances bring clarity and musical understanding to these works, with the fortepiano responding the gusto to the drama and emotion in the music. Tall Poppies is proud to announce that the covers for this series will feature paintings by Australia’s great painter, Fred Williams, giving this series a uniquely Australian flavour. The initial CDs have been generously supported by the Friends of the Canberra School of Music. To listen to Geoffrey Lancaster playing Haydn on the fortepiano is to be drawn ineluctably into the sound and mood world of the composer. And that was very much the case at a series of recitals that Lancaster gave in Perth recently. 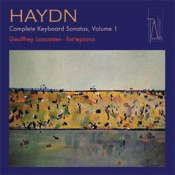 Before listening to the first of a projected series of compact disc recordings devoted to Haydn’s complete keyboard sonatas, I wondered to what extent that sense of spontaneity that made his live recitals so extraordinarily satisfying would be captured on disc. Would the freshness and vitality transfer successfully to recordings? Any concerns I might have had on this point evaporated within moments. There is a wonderful sense of spontaneity here – and it is abundantly in evidence. Indeed, the playing on this CD is so ‘alive’ that listening to it provides that additional frisson one associates primarily with experiencing a profound musical interpretation in the flesh, as it were. Over the years, I have lost count of the times I’ve heard Lancaster in recital. Hopefully, this recording and those to follow will allow listeners living far from the main routes of the international concert circuit to experience the magic of Lancaster’s interpretative insights. Just as in his recent recitals in Perth, each of the sonatas here is prefaced by a short prelude which, Lancaster explained to the audience, was the common practice in recital in Haydn’s day. Lancaster provides his own prelude to the Sonata No 32 in G minor but the other two sonatas – Sonata No 31 and Sonata No33 – are prefaced by preludes composed by Muzio Clementi. As a whole, this recording is pure delight. Make a point of adding it to your CD collection; it will enrich your music life. This is the first CD in a brilliant new project to record Haydn's keyboard sonatas, from the innovative Australian label Tall Poppies and pianist Geoffrey Lancaster. Lancaster, who performed the complete sonatas in concert series in Melbourne and Canberra in 2009, has been recording the works in Canberra using instruments from the collection of historic keyboard instruments housed in the Canberra School of Music, which has funded the initial releases in the series. If you thought Haydn had his musical self halfway into the 19th century, this CD is designed to change your mind with a throughly unpredictable and bookish 18th century attitude. Lancaster plays with positivist, amiable style, embellishing as he goes, and amusing himself as the first priority, assuming that listeners will automatically join in the fun. I'm not sure how much clarity and musical understanding these performances bring to Haydn, but clarity and musical understanding can sometimes be overrated. There is no doubt that Mr. Lancaster's instrument, a Paul McNulty copy of a 1788 (Augsburg) Johannes Andres Stein, responds with good-natured gusto to Haydn's epigrammatic sense of drama and somewhat obscure emotional involvement. As a further fillip, each of the three sonatas is introduced by a prelude, two by Clementi and one composed just prior to the recording session, "containing elements of preludes by Joseph Diettenhofer and John Burrows." As Haydn and the classical music mainstream go, this is a daring move but one that should be in the mainstream of how recordings add value to musical life. The results are preposterous but thoroughly delightful and should be on every Haydn lover's wish list. To use rubato or not: that is the question for pianists approaching the music of Haydn. On the one hand, it has become so commonplace to spurn rubato as a nineteenth-century Romantic artifice that a great many players seem to think composers of the Classical period have to be played with metronomic rigidity to satisfy the dictates of period performance practice. It's true enough that Haydn gives no indications in his piano music allowing the performer licence to speed up or slow down. However, Geoffrey Lancaster has extensively researched this area and, drawing on Quantz, Turk, Koch and other sources, shows in his detailed sleeve essay to this recording that rubato was an accepted part of piano playing in Haydn's time. Clearly this research has opened a door for Lancaster. In this first instalment of his project to record all of Haydn's keyboard sonatas, he manipulates tempo in ways that may seem surprising. But the results would only be controversial if they did not sound so natural and musically 'right’. There are three sonatas, dating from the years circa 1767-1780, being roughly the middle of Haydn's piano sonata output: No. 31 in A flat major (Hob. 16:46), No. 32 in G minor (Hob. 16:44) and the well known No. 33 in C minor (Hob. 16:20). Lancaster is lavish in all three in his use of rubato, indeed making it into even more of an expressive tool than dynamics. In almost every bar, he alters the written time value of notes to a very significant degree. Frequently, he accelerates into phrase and then lengthens out. Melodies grow and abate swiftly, but with great pliancy. Flourishes are dispatched with skittish rapidity. The effect is that little kernels of ideas, implicit in Haydn's typically compressed phrase structure, rise out with prominence and take on a floridly expressive character. What emerges is a vastly different picture of Haydn's musical language than if metronomic evenness were observed: everything feels localised, mobile and extremely inventive. It feels thoroughly convincing. Of course it also helps that Lancaster plays a fortepiano, in this case a crisp, bright sounding instrument by Paul McNulty copied from a 1788 Stein. More significant though, is how Lancaster's musicality has found a perfect home in the new interpretative approach to Haydn that he has evolved from research. A musician with exuberant tendencies, he revels in Haydn's buoyant, witty temperament. He makes the music sound sociable and conversational, as though Haydn himself is there in the room with you. Intriguingly, Lancaster prefaces each sonata with a prelude. One he originated himself (composing it "just prior to the recording session" from ideas from Diettenhofer and Burrowes), while the other two are by Clementi. Again, this idea of beginning with a short improvisation is one that Lancaster has found in his research to be integral to eighteenth-century keyboard practice. The only minor quibble is that the Clementi preludes are darker than Haydn's music and more exploratory in their pre-Romanticism. This is an important, indeed watershed recording. Geoffrey Lancaster's long and intimate association with Haydn's keyboard music is evident throughout this impressive new recording; the first disc in a complete cycle of the composer's 52 sonatas. Lancaster has studied these works for years and has performed the complete sonatas in recent concerts, so it's no surprise that his playing is commanding and finely honed. This recording project is a major undertaking, not just for the amount of music involved, but also for the intense concentration of Haydn's musical ideas and the interpretive sophistication required to bring the music to life. Written over a period of more than 40 years at the end of the 18th century, the sonatas are a diverse collection, musically and technically, reflecting Haydn's developing style and the nature of the performers and audiences for whom he was composing. The three sonatas presented here are from the middle of this period, numbers 31, 32 and 33 in the keys of A flat, G minor and C minor respectively. Using a reproduction 18th-century fortepiano, Lancaster brings a creative freshness to this measure and interspersed with elaborate ornamentation. His rhythmic flexibility is, at times, rather extreme and may cause concern to those who prefer a more metronomic approach. This is particularly the case in the first movement of the A-flat major sonata where Lancaster highlights the music's improvisatory quality with long breaths between phrases, extended pauses and considerable ornamentation. Every musical idea, each nuance and every gesture is sharply etched and distinctly characterised. The result is a vibrant and animated interpretation, and a surprising one, quite unlike any other. Lancaster is an intelligent and uncompromising interpreter and ideally suited to this repertoire. His extensive and erudite booklet commentary makes fascinating reading. The sound quality is first-rate; warm and resonant but with enough edge to hear the fortepiano's character. This will be a series to collect. instruments. Lancaster, who is head of keyboards there, has previously recorded some of these works on ABC Classics, but this collection - sonatas Nos.31-33, complete with charming little preludes to ease the listener into the different keys - is quite different. This is mainly because the fortepiano used on the Tall Poppies recording has a warmer sound and the presence is much more intimate. Whereas the ABC recording is what you might hear in a concert hall, this is what you'd hear in a smaller room. Lancaster has been toured Australian cities playing these works throughout 2009, including a fine recital at Angel Place where he brought out the wit, charm and intelligence of the works to such a degree that the listener could almost imagine it was being played by the composer. The same feeling pervades this CD, which is volume one in hopefully a long and equally enjoyable series. To lend even more Aussie flavour the covers for the series feature the unmistakable landscapes of Fred Williams. This first release in an auspicious integralé anticipates 2010 as did the historic re-releases of Haydn's complete symphonies [Nimbus NI 5847 - £25 for an 8 disc MP3 Box Set !] mark a new chapter in recorded music presentation in 2009. Lancaster, on a fine Walter/McNulty, gives the most winning and flexible interpretations of some of Haydn's finest and most lovable sonatas (the programmes are organised as recital programmes, not chronologically), each preceded with a little improvised preluding as was the custom in Haydn's time and, indeed, right into the early 20th C.
With a lavishly illustrated forty-four page booklet (in English only), this series gets off with all the background information, personal and historical, that you could possibly want. An imperative purchase, and one that should hasten the death-knell of the ubiquitous Steinway in this repertoire. It follows hard an anachronistic Haydn performance which prompted my recommendation that "with two major piano manufacturers' showrooms within a stone's throw of Wigmore Hall, arrangements might usefully be considered for suitable pianos (and a good fortepiano) to be made available for recitals there?" Put yourself on the waiting list for subsequent releases !